There are few things as full of promise as a single tulip bulb, planted in the fall, and left through the cold winter – all with the hope of a sunny spring flower. Don’t be fooled by their title, fall bulbs are labeled as such because they are planted in the fall, however, they produce their brightly coloured blooms in spring. 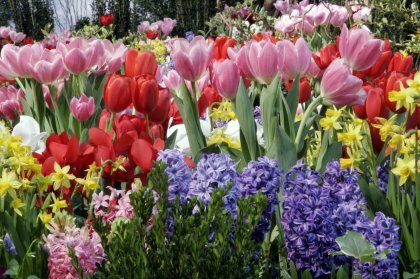 What is the secret to large, healthy spring flowers? The key lays in the bulb itself, and the care it receives. Let’s start by looking at the different types of fall bulbs that are available in this area. The most popular varieties include tulips, daffodils (also known as narcissus), crocus, hyacinths, and alliums. While hyacinths are better planted indoors in our climate, the rest are quite happy to enjoy a spot in our gardens, and will multiply year after year. When choosing your bulbs, keep in mind that the bigger the bulb, the bigger the bloom. Larger bulbs provide more food for the plant, and so will produce larger flowers. Smaller bulbs may not produce a flower in their first year. Bulbs look best when planted together in groups of odd numbers, or in rows. Be sure to look for a sunny location as most bulbs need the warm rays of the spring sun to bloom, and help keep the soil from staying too waterlogged. It is a good idea to start planting your bulbs shortly before the fall frosts start. 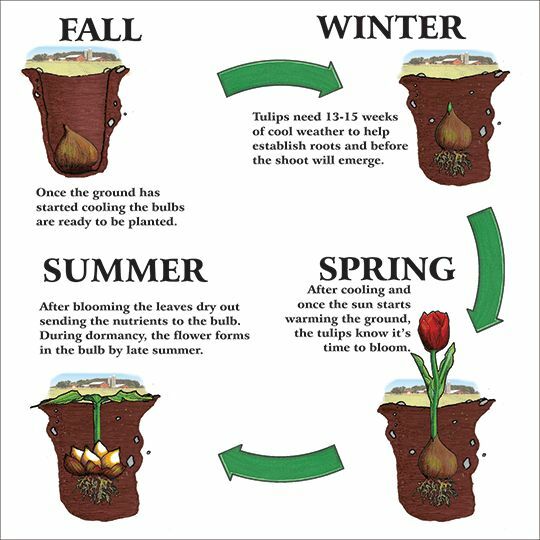 If you plant bulbs while it is warm, they may start to sprout and burn up the energy they need for next spring. If you plant them when the ground is frozen … well, it gets a little bit difficult to dig. Plant your bulbs, pointy end up, 6”-8” deep in the ground, and 4”-6” apart. It is a good idea to add some bone meal to the hole to help support root growth. Sprinkle the soil with water and keep it moist until the ground has frozen. Many people avoid planting fall bulbs because of persistent squirrels that can disturb them. Generally when squirrels forage they are not looking for bulbs, but rather for nuts, seeds, and berries. When a squirrel stumbles upon freshly-dug earth (the result of your bulb-planting adventure), he or she assumes that another critter has buried a stash of nuts. So the squirrel retrieves the loot, tastes it, and then — realizing it’s not what they were looking for — tosses it. This explains why we sometimes find bulbs dropped here and there in our yards, usually with a single bite mark. 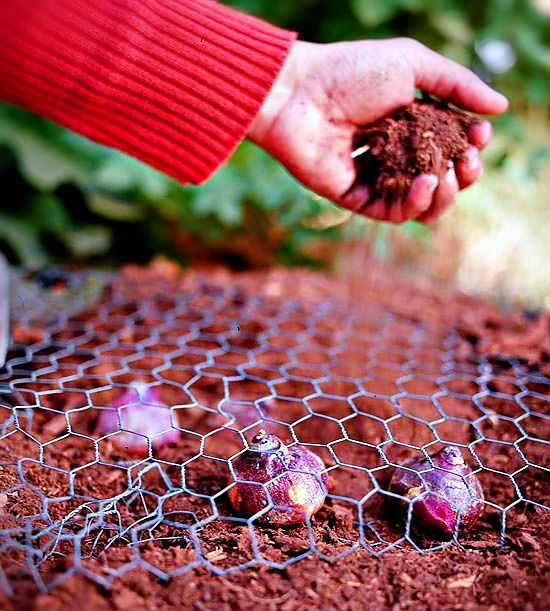 For truly persistent pests cover your bulbs with chicken wire. You can lay the wire across the whole area you are planting, either directly on the bulbs and then placing the soil on top, or by covering the bulbs with soil and then placing the wire on the top. The latter method enables you to remove the wire come spring. Plant squirrel ‘proof’ bulbs such as allium and daffodils with your tulip bulbs: these bulbs emit an odour which squirrels dislike. Squirrels also do not like the smell of blood meal, so you can sprinkle it (or a mix of blood and bone meal) around while planting your bulbs. There are a number of products available to deter squirrels. Bobbex gives off a strong smell of garlic and cloves which helps to keep squirrels and other rodents away. Doktor Doom No Bite is a spray which can be applied directly on your bulbs and has a bitter taste. Planting fall bulbs has a great reward: they are some of the earliest spring blooms and a welcome sight after a long winter. 2017 marks Canada’s 150th year, and to celebrate this, a new tulip has been released, aptly named ‘Canadian Celebration’. Show your Canadian pride by planting these red and white tulips now to enjoy next spring! happy for 150 Canadian day. Its very happy event. BTW great article. Those darn squirrels! We are sorry to hear you did not get to see them, but are happy you now have some tips to keep them away!